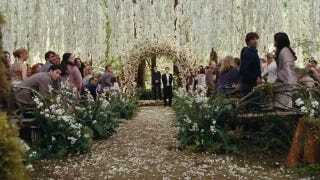 How Much Did The Twilight: Breaking Dawn Wedding Cost? Now that the Twilight Wedding of the Century is out in theaters and we have fed ourselves on its succulent romantic juices, we can get down to doing what you do after any good wedding: gossiping about how much it cost! Luckily, the folks at Centives have done the hard work for us, and the grand total for the whole shebang is… $38,000! Sure, that is a lot of money, but when you amortize that out over the length of eternity, it's a pretty good value. Especially if you consider that the average American wedding in 2010 cost $27,800, and those were for mere mortals who will realistically only squeeze a few decades of marriage out of it. So actually Edward and Bella's nuptials come off as pretty darn frugal. They could have been even more budget-friendly if they hadn't gone so overboard on the flowers, which, using a conservative estimate, cost them $20,000. But they are Edward and Bella! Come on! They deserve all the beautiful flowers in the world. Regardless, the cost of the Twilight wedding still pales in comparison to the Kardashian Wedding Shamtacular(worth all $10 million!) and the Prince William and Kate Middleton Royal Wedding Bonanza (which ran somewhere around $60 million).